I am sitting here having a nice easy Sunday. I have my pup on one side and my husband on the other. All feels right with the world. My world. And yet at the same time, my thumbs twiddle, my breath stops and I continue to live in a ‘what if’ state of mind. The next 7 and a half weeks may very well be the absolute longest weeks of my life. We are currently hanging by a thread, a thread of hope. There is no guarantee and there is no reality until he is here and the papers are signed and we bring him home. Big. Deep. Breath. And siiiiigh. And to tell you I am treading through this time with grace would be an absolute lie. I fall into two main categories lately. The first is to disconnect from it and try not to become too emotionally involved so that I can be much more guarded and then in the event things don’t go as planned, I will be protected. And then there is the other part of me that talks about it excitedly, wants to buy little trinkets for him, toys, stuffed animals and tiny outfits. This part of me has no inhibitions and is completely wrapped up in the joy this baby has brought me. And I bounce, back and forth and find myself somewhere on the spectrum at all times. When I go too far one way, I yank myself back in the opposite direction and try to reason with myself why that is the better place to be. There is absolutely no guarantee and whether this baby is ours or not in the end is 1,000% out of our control. THAT is what is killing me the most. We want to dive in, but we also know that we should probably suit up in a life vest and possibly a helmet as well for protection. But we are opening our hearts to this baby boy and planning our lives with him and our futures. And until it is a reality, it is really only a dream. Today, the anxiety is high. Maybe it’s because I sit here so calm and comfortable with my crew and as I do so I am aching for this dream to become a reality and to not slip through our fingers. But nothing I can do will push my fate one way or the other. And so I wait. And I try, so hard, to breathe, in and out, in and out. And the deepest part of me just wishes that 7 weeks could pass in a blink of an eye. Again, a dream. So here’s to reality, and here is to our perfect angel who we already love so much and hope that we will get the privilege of being his mommy and daddy, forever. Did you ever hear that song perhaps in Sunday School that went, “Pharaoh, Pharaoh, Oooooh Pharaoh, let my people go, yea, yea, yea yea….”? There were even motions to it. Well, I can certainly say I now cannot make or eat Farro without that song stuck in my head. I apologize in advance if you have the same issue! 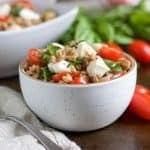 Farro was another one of those foods I never made but then once I did thought, what took so long?! This stuff is so good and so easy to make. I have got to stop sticking to my same old, same olds, because there really is so much out there! 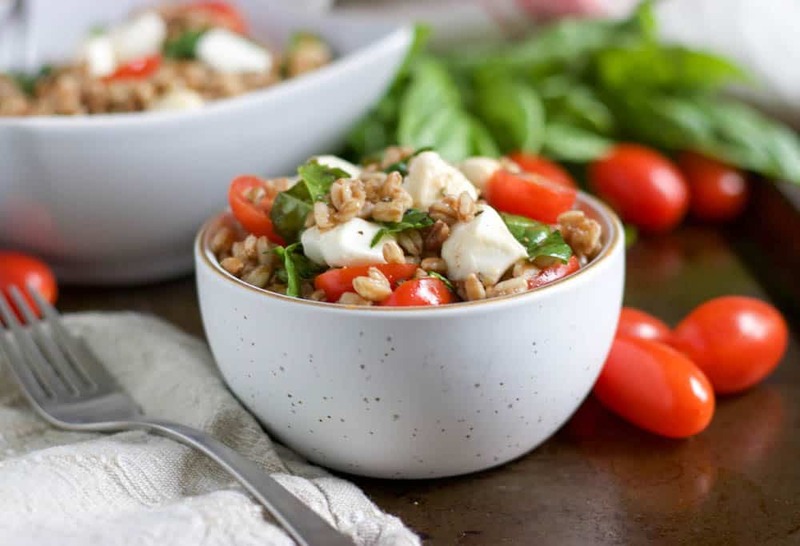 I mean, Farro is really just a matter of boiling water and cooking. Done. And the bonus of this salad, aside from the fact that it is so good, is that I was able to get tomatoes and basil straight from the garden. I have really not been loving tomatoes these days as much as I used to until I bite into one fresh from the garden. Unbeatable. I grew tomatoes the last three years in my garden and this is the first year they made it to harvest. Not sure what my issue was the first couple years, but they just died halfway through the season. Fresh basil, mozzarella pearls, juicy tomatoes, balsamic–need I say more? 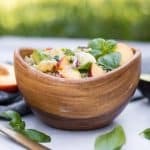 This salad is bursting with flavor and so simple to toss together. Perfect as a side for dinner or on it’s own for lunch. I hid this one in the back of the fridge because I was NOT in the mood to share it with Anthony. Guilty! I didn’t need any taste testing on this salad, I knew it was a winner from the get go. It looks so fancy, but is so simple you can’t go wrong! 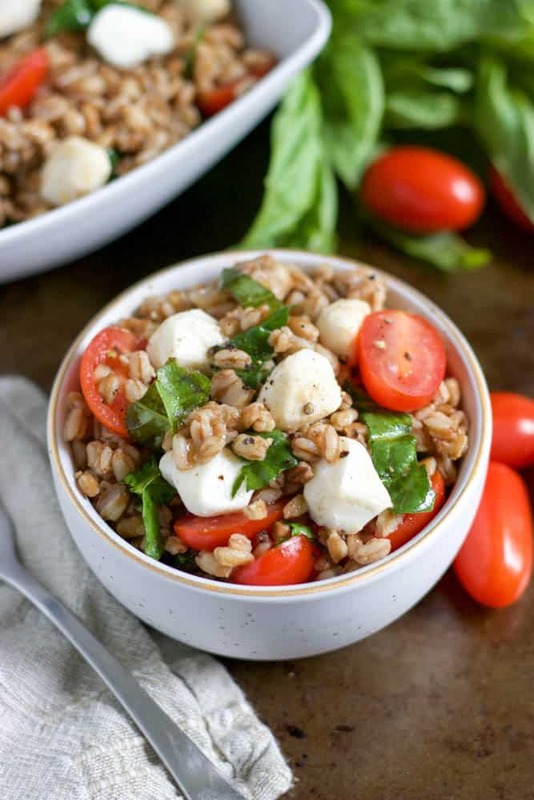 When farro is ready, drain and then toss spinach with farro in a medium bowl to wilt spinach. Add in garlic, basil, tomatoes, balsamic, olive oil and salt and pepper. Toss to coat all ingredients. Allow to cool for a few minutes and then add in mozzarella and toss to combine. You can eat this slightly warm or allow to chill for 15-20 minutes before serving.